Volleyball phrases can help motivate your team. Key concepts for mental training. 1. Trust to learn (take risks). 2. Know the opposing defense and hitters' tendencies (challenge your players to think). 3. Attack with confidence (rather than overthinking and avoiding). 4. Use composure and avoid intimidation. Relentless defense is the mindset of champion teams. Passers who don't communicate with fellow passers are rarely good at talking strategy before the serve. Never take your eye off the play. Get the libero bored and then serve her. Calling serves is like an art form. Listen to your feelings and your gut. Jumping over the river may be the best way ever to train volleyball footwork for attacking. In the beginning of the match, shut down the line attack to discourage your opponent from challenging it...make them attack cross court. Your entire team must understand the game plan and must be constantly reminded what that means. Pass close to the center of the court, if you go too far right your setter will be forced to set back or middle (unless she's a freak). Informing the players of what their roles are is a requirement of top level teams. The short deep serving strategy is king. Attackers must be aware of the common tipping options they have for each set. Unless the players serve is dynamic, they must have the ability to serve short. "Nowhere is it clearer than in competitive sport that you have to love it and appreciate the process. Becoming the best competitor you can be means loving to compete more than winning. Nowhere is it more evident than in competitive sport that, in the long run, toughness prevails over talent every time. Victories in any area of life will be determined far more by spirit and ability to fight than by genetic gifts. To play a game, to love it is one of the greatest joys of youth...only later do we come to understand that it is one of the greatest joys of life. 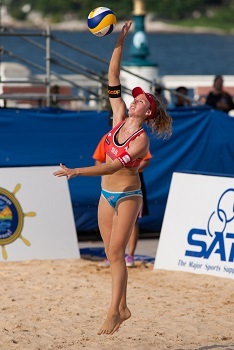 Read the setter while staying balanced and ready to move to follow the ball. See the hitter attack by keeping your head level and eyes open. Press over the net before the hitter swings. See the back of your hands when you reach forward to block. Face your hands to the middle of the court to block the ball into the center of the court. Move like a big cat, agile, mobile, and hostile to the attack. Land like a cat and you will save your knees and avoid errors. Balance is the key to read the block effectively. Keep your hands strong to block the ball back at the hitter's court. Follow the ball with your eyes after it passes you and goes into your court. Balance is important while you are jumping in the air to block over the net. 1. Stay calm in tense situations. 2. Correct a skill through mental repetition. 3. Plant positive thoughts in their minds (tell them what you want them to do, not what you don't want them to do). The following are some simple volleyball phrases to help get your team thinking the right way. Keep things simple and do the simple things well. Eliminate overtraining, overmeeting, overcoaching, and overthinking. Find a balance. Know your team's needs. Be Patient. Allow your players to make mistakes and give them time to grow.